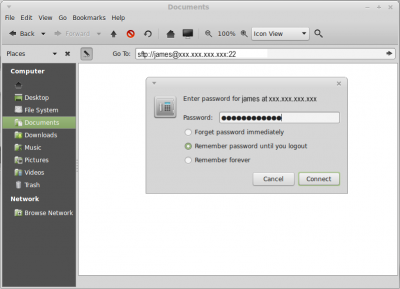 Linux users can access their Linux server installations remotely a couple of ways. Putty - a command line terminal interface for Windows. Tunnelier - a Windows graphical interface that provides many different protocols such as sFTP over SSH. $ ssh -p port# username@ipaddress (default port is 22) i.e. Alternatively, you may want to have a graphical interface available for transferring files to and from your server. You may use any of the distribution's file managers to connect directly to your server. 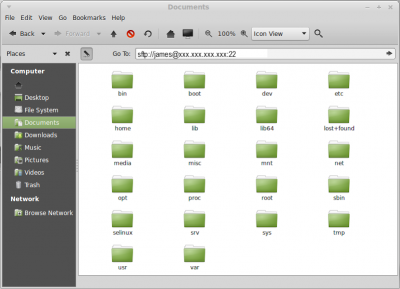 For Example using Linux Mint 17 and its' file manager to access a server with sFTP over SSH on CentOS or RHEL: Any desktop Linux distribution has a file manager built in that will work. File manager displays directory structure of server machine in a 'friendly' graphical interface much like the Windows client Tunnelier. Last update on November 18, 3:38 am by Admin.